The base of my card is using the Basic Gray card stock and it is cut average size of 4 1/4" x 11" scored at 5 1/2". 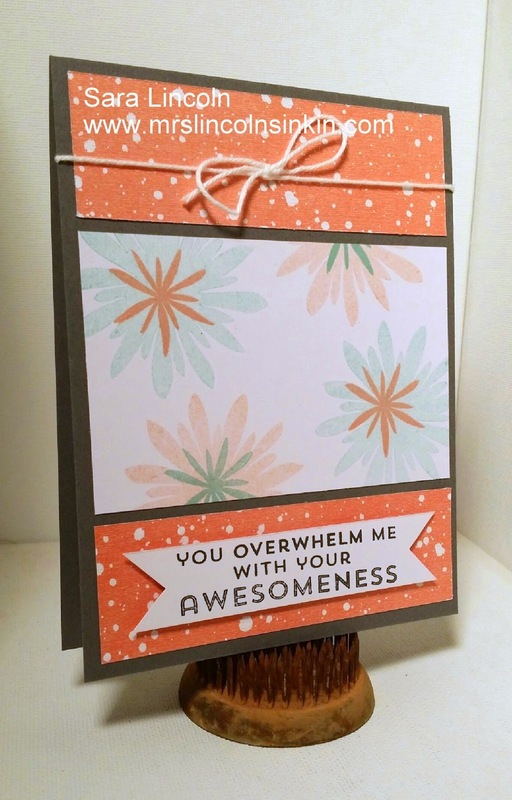 I used the Best Year Ever DSP that is available right now in the Sale-A-Bration catalog! You can get this product for free if you place an order of $50 or more before s/h and tax. I cut the pieces of my DSP and my Whisper White a little smaller so that my Basic Gray would show through all around them. The colors that i used for my flowers were Coastal Cabana and Crisp Cantaloupe. I didn't want all my flowers to be so vibrant so I stamped off for some and then just normal for others. Gives it a different look:) I then took my Whisper White Twine and tied a little bow at the top. The item that I am showcasing today is going to be the Flower Patch set. This set also comes in a bundle where you can get the coordinating framelits. When you purchase it like this you receive 15% off. "AWESOME"!! !